it has bin a furry busy month. first dere was dis whole boris thing. he hung about and stole my biskuts and stuff. den dere was dis klaw in my face. It got all infektud. i was showing de feemale survunt how brave i am and what did she doo? she took me to the VET!!!! yes i am suffering a lot. but i haf also been furry klever. i now haf al de food i wnat, and treats, and games. it is all bekos of dissiplin. i will tell you my sekret. dey will get the messsage and do what you want. it always wurks. like boris. i complayned and complayned about boris and NUTFFING but when i showed my tayul de feemale finally got rid of him. he's a lap cat now in sum teacher's house. Didn't know he could swim, but all i can say is he deserves what he gets. HAH! and dat VET thing works fur me too bekos i showd hur de tayul after we kame home. den de feemale survunt felt guiltee and gave me treats. also furry humbol apologees. now i take my medisin efurry day, and den aftur i hiss a little big and flik my tayul and she is all, sorry Au meow (she is furry soppy) you are sutch a good boy to take your medisin. how about some chikkun? Den i sulk for a long time like too sekkunds and den i get a treat. if i sulk for too minutes i can get her to bring me treats to my upstairs bocks. honest. hehehe, i am a klevur kat! Aww...I can see Au is getting better at blogging..meowww! You are smart to ask for treats when you take medicine. I am sorry you got a klaw in your face, Au! You are such a handsome macho kitty! I trust you're all better now. The tayul -- now don't go giving my Rowdies ideas! They don't know how to do the tayul and I don't want them to start! Glad Boris found a new home and you have your feemale survunt all to yourself again! You got a claw in the face? We are sorry for you! I flips my tail when I am not happy! Spooky here is an expert at tail flipping! Au, you are VERY CLEVER indeed! But of course we knew that cats rule, humans drool. We hope you feel much better soon, Au! Our mom laughed and laughed at your blog post - you did a great job. P.S. Good job on getting the human to bring you treats upstairs! Franklin gets us treat every day because he has to take medicine, but we have to come into the kitchen to get them. I am glad you finally got a follower button! Yea! I am glad Au is so clever. Maybe he can teach Peeve somethings. Peeve is a fur brain too. MeWow...did you go to school to get so smart? You know the power of the tail and how to use your eyes to their best advantage. Hope the claw mark is healing up, too. Oh, Au is so clever. I love the way you "speak"! And glad you are all come back! Yes, let me "follow" you. How exciting! Au, you are so clever to think of these things! You must stand firm. "Talk to the tail 'cuz the face ain't listening." furget writing books - Au should open a dissiplin Skool. for huumins. You certainly have it all figured out. I hope the klaw wound is healing nicely. I love it when 'Au Speaks Out', he's such a cutie! By the way, thanks for dropping a comment in my blog. 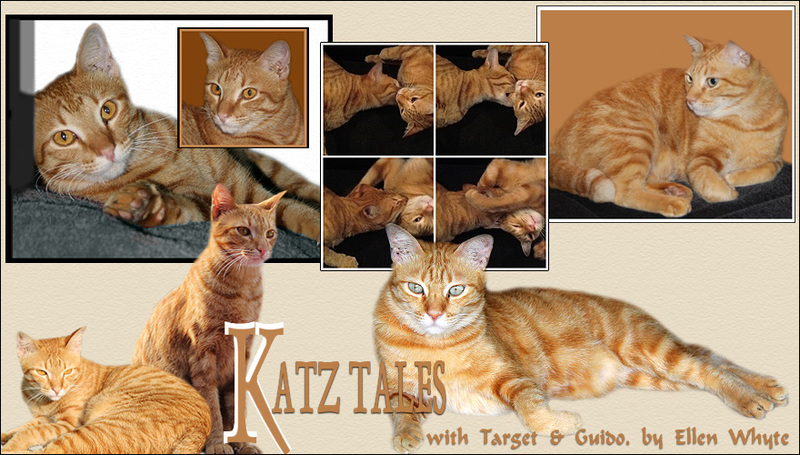 You were the last person I had in mind to comment, and I have to say, I adore your Katz Tales section and it's always the one I search for when I buy my copy of The Star. I also love it that you're talking about cats, and somehow it made me so smiley and happy. Again, thanks. Au, Target, and you always, always make me smile.